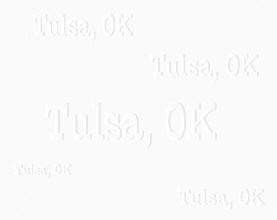 A nice map showing Tulsa and the surrounding areas. If you look at the railroad running from Tulsa up the map to the right to Vinita and then down to Muskogee you can see the distance anyone who needed to go to the Federal Courthouse in Muskogee had to travel. Although it was much shorter to travel across from Tulsa to Muskogee, it wasn't a safe trip by horse.